Have you tried fixing shisha with kutch work? That's what Iam doing now. After the doodling on my daughter's pyjama , Iam trying shisha on the remaining one. The inspiration came from a couple of pictures of a pouch which Anne mailed me asking about the stitch used. Anne bought this piece while on a trip to Jaipur,Rajasthan. 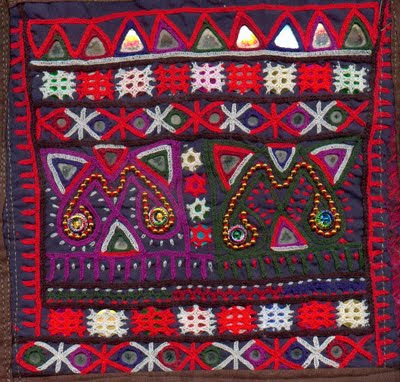 Kutch work is also known by the name Sindhi stitch, Sindhi taropa, Kutchi kadai or Maltese cross and is related to Armenian embroidery .The embroidery is believed to have travelled across continents thanks to nomadic tribes.There are quite a few tutorials available online which teaches the basics of this interlacing work. But the tutorial for this pattern was not available .So I had to experiment a bit on it. First I tried the stitch without mirror/sequin. The squares were too big. This wouldn't do for little one's pyjama. Second attempt. Still not small enough. Third attempt on the pyjama with small square and a big sequin.First I tacked down the sequin with red thread(sheesh!!) Never thought that the thread will be visible through the gap.In the second attempt (the incomplete one) I didn't even bother to tack down the sequin. Her royal highness was happy to see this one...but then, she again asked the question ....ma,where are the beads? So, I am off to add beads now and complete the rest of interlacing. If in case you need a tutorial on how to do this particular pattern,do let me know. This is so pretty, Deepa. I would love to give it a try too. So I hope you can do a turorial for this. Deepa, once again you have done a fantastic job! No wonder "her highness" (tee hee) is pleased, especially when she knows she can wrap Mama around her little finger and get those beads! Hugs. This is a very interesting stitch, Deepa, and is quite effective! I'll be looking to see the beads you add. That's pretty incredible Deepa - I must look up the instructions and give it a try. I've never liked the patterns I normally see for shisha because I find that the mirror quite often comes out, unless it's stitched down in some other manner. This is a great idea! Deepa your shisha mirror work is beautiful. I like this way of securing the mirrors. This is beautiful, such an accurate and patient work. Just amazing! It is very beautiful and perfect! this is so interesting, seeing the original piece and then seeing you working things out, your stitiching is so meticulous and beautiful. Do I see triangular shisha in the borders of the pouch as well? I am very impressed by your sampler and demonstration. Yes, I should like a tutorial if you can. when you have answered about the links, I have tried, but it was difficult to follow the trail of the thread. I think there is a good size of the pattern (not too big bht wit) What thread have you use and please give also the approximative. Thanks also for the very clear photos!! kollallo! very nice.. would love to see the tutorial of this one! love those intricate trellises you've created. joining the tutorial clamor here. Thanks for sharing! Looks very nice and neat. Good Luck! OH Deepa, You are a master! and the little Princess is so lucky!! This is so beautiful, i just cant move my eyes off it! Looking forward to the tutorial!! eeks! I do not know Kutch work...will this be easy to learn! Many many questions on mind right now! 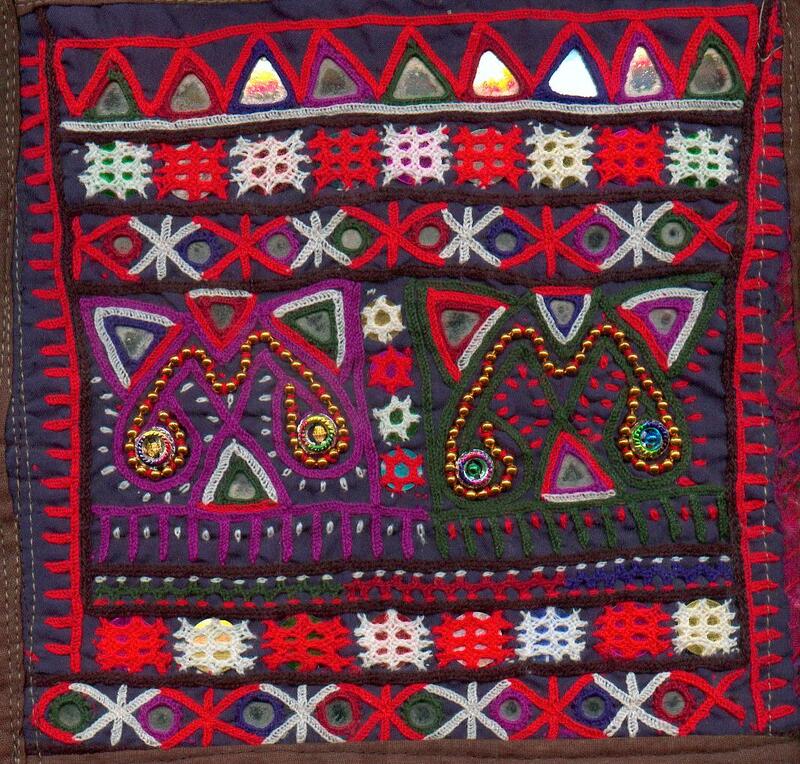 Very nice Kutch work. I know the basics but not this one. plsssssssss do a tutorial for this.. i tried to do this more than one week but unable to..pls dear.. Your tutorials are wonderful - so clear and easy to follow. Thank you so much for taking the time to do this.